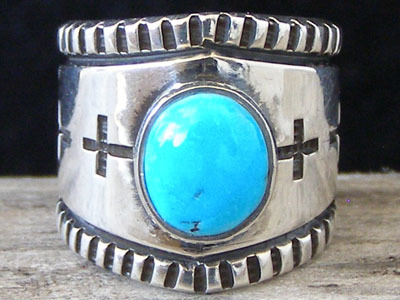 This ring is set with an oval of clear blue natural Sleeping Beauty turquoise from Arizona. A wide, straight-edged bezel holds the stone and raises it well above the plane of the ring's band. Four corners crosses are deep-stamped along the equator of the band to left and right of the stone. Harrison used a cold chisel to notch the edges of this band. The band gently tapers towards the back of the shank. Width of shank in front: 13/16"